Understanding facts about vitamins and health does not have to be hard! "Do I need to take a vitamin or supplement?" That is a question that many people find themselves asking. With so many books and so much research to read, answering this question for yourself can be overwhelming. I know just how you feel. Health facts and information should be easily accessible and easy to understand. But if you are like me, you have probably already found just the opposite, health information that is long and time consuming to work through. True, there are hundreds of health studies to show that taking a daily dietary supplement can promote good health and prevent disease, but who has time to read such time consuming information. I'm sure you know that in order to maintain a healthy body and mind, some personal research is necessary. Good health is a continuous lifelong process that should not be taken lightly. I get it! I am just like you. I am a person who decided that I was going to take control of myself and better my health. So CONGRATULATIONS, you're here at Vitamins-and-Health-Facts.com which means that you too want to learn more about vitamins and other supplements and how they can benefit you. This site is designed to help you sort through all the info. So welcome! if you're interested in understanding more about vitamins and other supplements - in layman's terms, you're in the write place. I'm glad to have you! Gaining knowledge is key in the process of building a healthier you. So if you went to medical school...sorry. You will not find many big-hard to pronounce words here :). Find out what are the most effective vitamins and supplements to take. 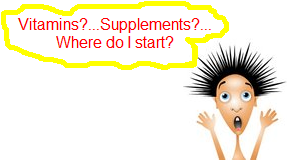 Answers to F.A.Qs about supplementing. Tips on choosing a dietary supplement. Learn what supplement has been called "The Fountain of Youth" and can help control your weight. Which supplement will help you build a body of strong bones (yes, calcium...but what else?). Get facts on fats and oils and learn about the differences in fats. What is a Vitamin? Keep it simple please! You can learn what a vitamin is and vitamin facts without needing a medical degree. Vitamins and Health blog will keep your up-to-date with all the latest changes and additions to the Vitamins-and-Health-Facts.com website. Learn more about the benefits of vitamin A and symptoms of overdose and deficiency. Get the facts about vitamin A. Learn the facts about the vitamin B group and how this group can benefit your health. Vitamin C is known a natures cold medicine. What eles does it have to offer? Learn the facts about vitamin C; benefits, overdose, and deficiency sysmptoms. Learn the facts about vitamin D. Gain more knowledge about the benefits, overdose and deficiency symptoms of vitamin D.
Get the health facts about vitamin E without needing a medical dictionary. Learn about the benefits, overdose, and deficiency symptoms . Get the facts about the benefits, overdose symptoms, and deficiency symptoms of vitamin K.
An herbal list to easily guide you through some of the most popular and most effective supplements. Charts and lists that are easy to understand, quick to read, and provide plenty of information. Health concerns and questions are common, get answers to some common health questions. Get the answers to some frequently asked questions about supplements.